Archaeologists from University of Leicester Archaeological Services (ULAS) have recently excavated a Late Roman cemetery at Western Road in Leicester's West End. 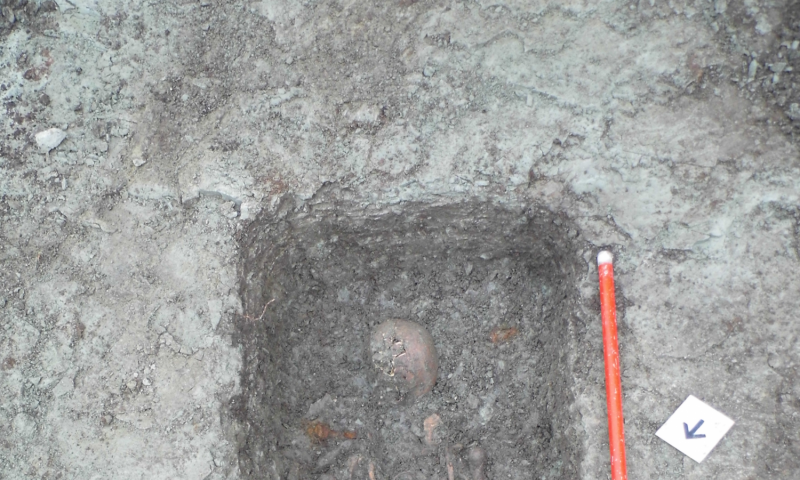 Amongst the 83 skeletons recorded by the team, one burial is proving to be very exciting. 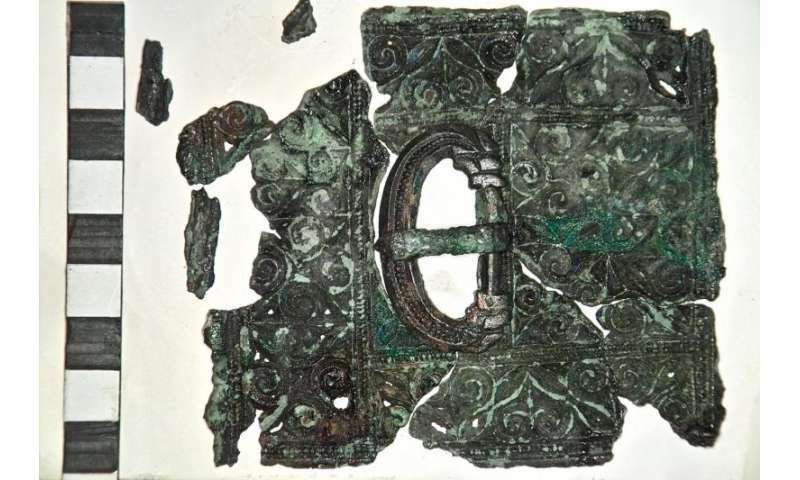 Nick Cooper, Post-Excavation Manager at ULAS, said: "The survival of the delicate thin sheet bronze belt plate is remarkable. 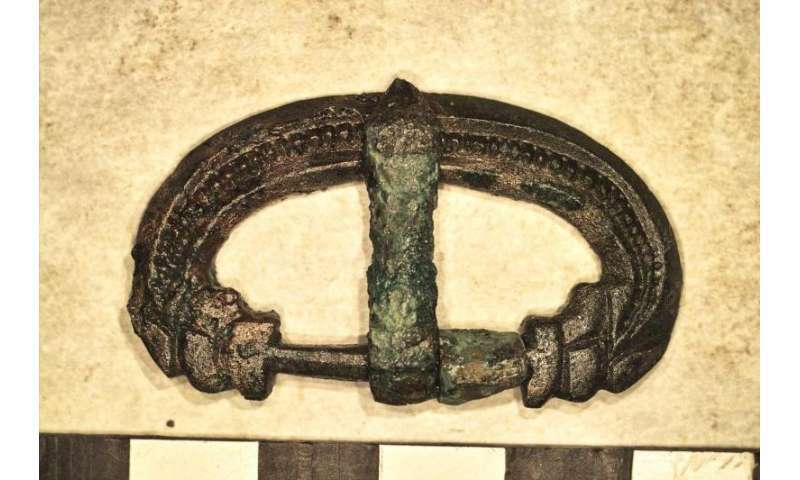 It is cast in the so-called 'chip-carved' style decorated with interlocking spirals and would have been riveted to a wide leather belt or girdle with a thinner securing strap running through the buckle and ending with the strap end." 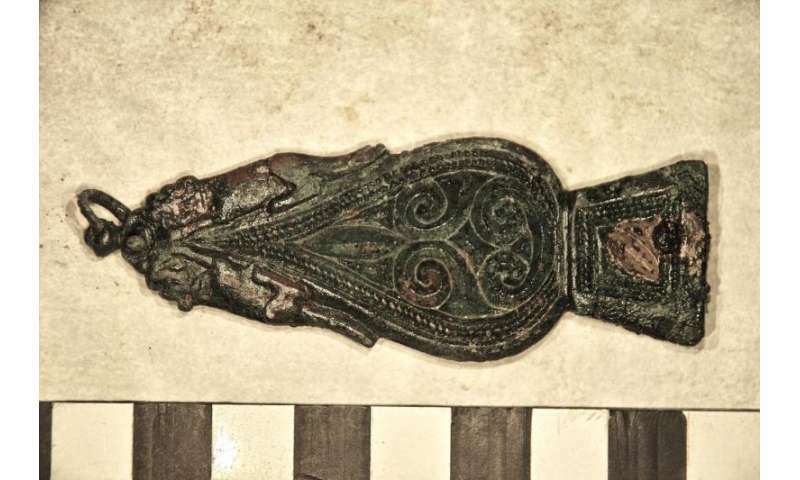 The recent discovery at Western Road is the first occurrence of such a complex belt set in Roman Leicester. The belt's owner was aged between 36 and 45 when he died. He had survived poor health in childhood to lead a comparatively fit adult life but at some point he had fractured his left forearm; an injury that had healed well but left his wrist weakened. This type of injury is known as a 'parry fracture' and is typically caused by raising the arm to ward off a blow or a falling object. The man had also damaged muscles in his upper right arm and shoulder. Such injuries could possibly be caused by over-use, overextending the muscles with movements such as throwing and lifting. Whilst it is difficult to identify exactly what caused these injuries, they are consistent with those a soldier might suffer and reinforce the theory that this man was either a member of the late Roman army or, perhaps following retirement, became an important local civil servant. The project is funded by Jamie Lewis Residential as part of the site's redevelopment. Excavation and analysis of the skeletal assemblage has been carried out by a multi-disciplinary team of researchers from University of Leicester Archaeological Services (ULAS), York Osteoarchaeology Ltd., the Scottish Universities Environmental Research Centre (SUERC) and the British Geological Survey (BGS). The belt has been conserved by Graham Morgan.